Description: Male chaffinches have pink faces with a black forehead. They have a pink breast and belly, black wings with conspicuous white bars and a black tail with white outer feathers. Male chaffinches have dark brown eyes and pinkish-brown legs and feet and its bill is blue-grey in breeding season but dull grey-pink at other times. Female chaffinches have similar facial feathers to male chaffinches but they are much plainer in colour with olive-brown plumage and creamier, smaller wing bars. Juveniles look similar to adult females. 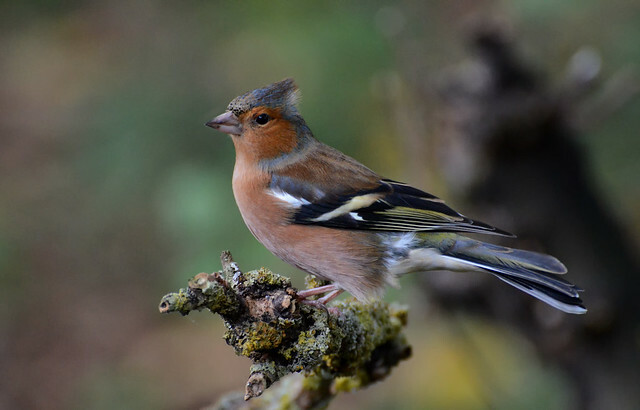 Nesting: Chaffinches will breed in woodland, particularly coniferous plantations, although they will also nest in gardens and parks with trees and bushes. The female chaffinch builds the nest in a fork of a tree or concealed bush using moss, grass, lichens, roots and moss to make a cup shape bound together with spiders’ webs. It is lined with hair and feathers. Chaffinches lay 4-5 pale blue eggs with reddish-grey or purple-brown blotches and scrawls. The female incubates the eggs for 10-16 days and chicks are fed by both parents. They leave the nest at 13-14 days but still depend on their parents for a further week until they can feed and fly. Feeding: Chaffinches form large groups in winter eating seeds and fruit from farmland and gardens.. During breeding season they are fiercely territorial and will supplement their diet with caterpillars. Where to see them: Chaffinches can be seen all year round across the UK in woodlands, hedgerows, fields, parks and gardens. Did you know? Chaffinches have regional accents with slight variations in their songs depending on where in the country they live.